Driving in South Africa, Swaziland up to Kruger. We flew back to Jo’burg (from Botswana) and picked up a rental car, midsize Honda. 10 days Avis with insurance was $635. Plus GPS that was very helpful at $10 a day. We drove to Dundee it was about 5 hours. There’s not much to this town, but it was clean and good for our purposes. Stayed 2 nights at the Royal Country Inn. 600R with breakfast. There’s a pub in the hotel. Secure parking in back. Restaurant food was good and a steak cost 73R. For dinner we went to Ingudlame, a couple minutes up the road from the hotel. Just past the museum you will see a sign for it. It is a game reserve with a lodge. Be careful driving in as we saw zebras on the road. If you get there before sunset go out to the deck where they have a water hole and you may see some animals around it. Food was very good it was about 70R for entrees. 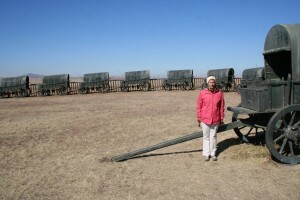 Next day we did a self drive to Blood River on the road to Swaziland. This is the sight of the Voortrekkers – Zulu Battle. You can do a self tour just ask the person in the museum to put on the English DVD before you walk around. The road is gravel but you don’t need a 4 x 4. Afer visiting the site, cross the river to the Zulu museum. It gives a good history of the Zulus and tells about their culture. It also has some slightly different interpretations of what happened at Blood River. Crossing the border was no problem. We were visiting friends so I can’t give you the tourist take on this country. We stayed In the Ezulwini Valley at The Lugogo Sun Hotel for one night before changing to the Tum’s George Hotel. What a difference!! Lugogo Sun was about $150 a night and wasn’t worth the price. It had all the American amenities but the rooms had seen much better days and the place was overcrowded. The George Hotel was in Manzini about 15 minutes down the road. We saved about $50 and it was perfect. Clean, quaint quiet with nice rooms surrounded by a pool with a bar. Also a pub with a pool table next door served good pizza. A great place to escape after an active day. We decide to drive thru the park on our way to Sabi Sands private game reserve. If you are in South Africa and don’t want to spend a fortune go to Kruger!! It cost 280R for a day pass. The roads are all asphalt. We came in thru the Malelane Gate. Outside the gate there are hotels and golf courses. Just before reaching the gate to pay the fee cars were parked on the bridge. We took a look and saw Crocs sunning themselves and a herd Impalas. Once in the park my first spot was a Warthog (being a safari vet I knew the names of the animals we saw from the car) Just driving through on our way to our destination we saw Impalas grazing, stopped for Elephants crossing the road, Zebras, Wildebeests, and even a Hyena Pup. The problem with the park is you can find yourself in a traffic jam when many cars stop to look at the same animal. We were stuck for what seemed like an hour when a Leopard had killed an impala feet from the road. Not only couldn’t you see the Leopard but we counted 18 cars causing the jam. 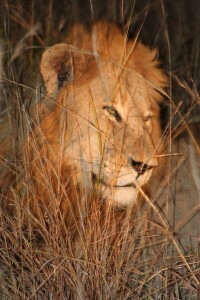 Sabi Sands Reserve/Sabi Sabi: If you are in South Africa you should not miss a trip to either Kruger or the Reserve. It is worth it! The reserve is adjacent to the park, it is privately owned but there are no fences between the property and the Kruger park. The road is dirt but we were ok in our midsize vehicle. We paid 80R at Shaws gate. Keep the permit they hand you, it must be stamped by your lodge in order to get out of the property. We saw all of the Big Five here. 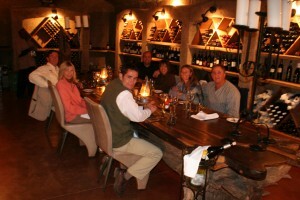 I name the guides here because they are your “hosts” the entire time you are on the property. Like the lodges in Botswana – these are top of the line. My favorite of the two we stayed at. It was more rustic in decor, but the amenities were still first rate. Big rooms, good food, pool, water bottles, blankets on the drives, heat and a/c. In the rooms is a book about all the wildlife that is worth reading. You felt like you were in the bush. Right off the deck was a watering hole where animals came to cool off. The managers told us the day before we got there they witnessed a pride of lions take down an impala while they were having their morning coffee. There was also an elephant that had to be chased out of this camp. 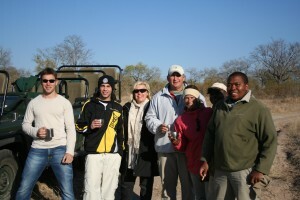 Unlike Botswana the guides carry guns and a tracker is part of the team. 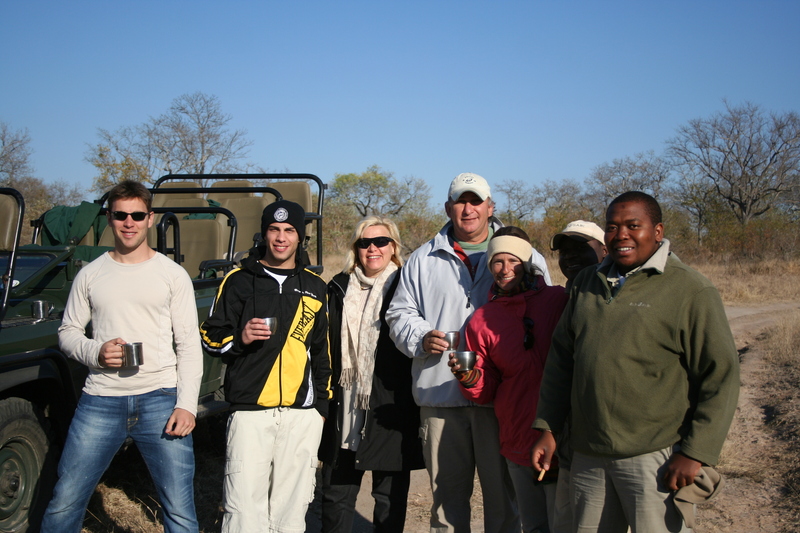 KG and tracker Zeb were our guides and hosts for our stay and they were terrific!! KG has been doing this a long time and he is a wealth of knowledge. A good place to stay if you are traveling with children. Wow. No surprise this place wins a lot of best of awards. It is beautiful. First thing you will notice is the furniture in the common areas is made out of trees that were downed during the floods. The bar is one huge tree which had to be placed before the roof was attached. A beautiful wine cellar, and if you like good scotch you will find it here. The spa is first rate. The roofs of the rooms look like termite mounds to blend in with the landscape. This place is POSH. The food was up there with the best I have ever had, and I like fine dinning. It was a bit high brow for me and a little more refined than Selati. Because of that and the fact we saw more animals during our down time I liked Selati better. My only real complaint about anything at Sabi Sabi was at check out we should have been reminded to get our exit permit stamped. We weren’t and had to drive that dirt road all the way back to get the stamp. But that was it. Earth Lodge was still amazing. I did see an Elephant pass my room (which by the way had its own patio and dipping pool). We also had to chase away Waterbucks to get into our room one night. Richard and Tracker Goodman, our guide and hosts were also terrific. Richard focused on more than just the big game during our drives.